With the position players all set, it’s now time to move onto the pitchers. Our analysts began with the starting rotation, the backbone of this Red Sox team. The starters were ravaged with injuries throughout the season. However these four starters were more than serviceable throughout the year, and one exorcized his postseason demons. Without further ado, it’s time to examine Chris Sale and co.
Jeremy: It still kills me that Chris Sale hasn’t won a Cy Young, and he might’ve had a legitimate case this year even though he spent a large part of it on the shelf. The lanky lefty was downright dominant throughout large portions of the year but inevitably fell into another August-September hole, this time with injuries. Now, he was still able to gut out several postseason starts and fittingly struck out Manny Machado to finish the job against the Dodgers. But was this the season that I wanted from Chris Sale? Honestly, no. He is the second best pitcher in the game, but he has yet to truly put a full season together. Jordan: It’s a shame Sale spent most of his second half on the shelf because he was a shoo-in for the Cy Young award when Luis Severino started to struggle. However, he was heavily derailed by that bum shoulder, and you even saw that in October. A man who is due for a big pay-day after the 2019 season needs to stay healthy from start-to-finish if he wants to remain in Boston at a price that’s fair to someone of his caliber. I love Sale, and I think he’s primed to be elite again in 2019, but I don’t think it’s far-fetched to say he might go down as the best pitcher who will never win a Cy Young for one reason or another. 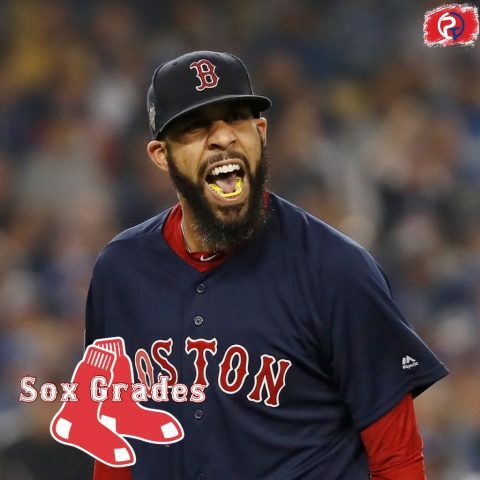 I can’t give him a grade that’s as high as a Bogaerts, a Betts, or a Martinez because he simply could not stay healthy. Let’s face it; the stats that Price put up in the regular season don’t matter. It is normal for him; there’s a reason he is getting paid so much money. He is paid like an ace, and he put very good numbers outside of two starts against New York and one against Texas. Price was the rock down the stretch with Sale hurt. But let’s talk about the playoffs. I predicted that Price would make a postseason start where he would pitch a gem and get into the eighth. I figured he would give up two or three, but instead, he did me one better and gave up one against the Dodgers. I said it after the season; going into the 2019 playoffs, I want David Price starting Game 1. He’s proved it for me; now he just needs to figure out how to pitch against New York. Jordan: I won’t even focus on how reliable this man was in the regular season, because that doesn’t matter in the grand scheme of things. He finally put the haters to bed, including our beloved Nate Rollins, with his October performance. The guy was a bulldog in October and carried the Red Sox with impressive showings in Game 5 against Houston, and Games 2 and 5 against the Dodgers. He owns all the cards now. We cannot talk trash about him in the playoffs anymore. It’s O V E R.
Jeremy: Rick Porcello performed admirably throughout the season, considering it was 2018. Porcello has been afflicted with the Josh Beckett odd-even year syndrome, and he was due for a monster season. The right-hander tossed perhaps the outing of the year, a one-hit complete game gem against the Yankees in under 90 pitches. His outings in the postseason were also emotion-filled, and although he is getting overpaid as a third starter, his calming presence and steadying hand helped a Red Sox rotation that was besieged by injuries throughout the year. The biggest difference from last year to this year was the fact that he gave up 11 fewer homers after leading the league in home runs given up last year. However, this was still a far cry from the Rick Porcello we have seen before. Jordan: Odd… Even… Odd… Even… That’s been Rick Porcello’s Red Sox career thus far. Thankfully for the 2018 Red Sox, he was in his even year bag. Porcello dazzled at times, especially in his starts against the Yankees. And while his start against the Astros wasn’t the way he probably envisioned, he still pitched a very solid game. He, like Price, was able to shake the postseason jitters and really fall into the category or “bulldog” with how he was able to do in the rotation as well as the bullpen. Jeremy: 2018 was a redemption year for Nathan Eovaldi; he just picked the Red Sox to carry on his back. The biggest start of the year was Game 3 in New York, and after a pedestrian regular season, all eyes were on Eovaldi, anxious to see if he could break through for a team that had faltered in each of the past two postseasons. Eovaldi delivered and came through again against Houston to prove that he wasn’t only good against New York. His gutsy relief effort in Game 3 against the Dodgers will live in Red Sox annals along with the likes of Curt Schilling’s ‘Bloody Sock’ game. I don’t think the Red Sox should have given him the contract they did, but hey, we always have Game 3 right? Jordan: If you were disappointed in what Nathan Eovaldi showed in his few months with the Red Sox in 2018, I don’t know what to tell you. He had a rough couple of starts after throwing 15 straight scoreless innings to begin his Sox career, but his numbers rounded into form at a 3.33 ERA. But look at what he did in October. We give a lot of credit to David Price, and rightfully so. But Eovaldi looked better at times. He had a better ERA, at 1.61, whereas Price had a 3.46 (inflated by three earned in 1.2 innings against the Yankees). Evo’s Game 3 performance was arguably the greatest pitching performance I have ever seen in a losing effort. I know Jeremy thinks his contract screwed the Red Sox this year in regards to their salary structure, but I’m glad he’s back. Looking for big things from him in his first full season working with Dana and Pedro.